Often our defensive plan vs. 7 man pass pro is to use a base pass rush and drop 7 into coverage. While that may be a good plan, what are some potential pitfalls? The defense may have a bad match up on deep routes. If the offense has a WR that can beat a DB 1 on 1, the offense can exploit that with a protection scheme that allows the WR the time to beat the DB. 7 man pro also allows the offense to run double move routes like Out&Up or Post-Corner. Multiple move routes can be difficult to cover even for the most talented DB's. Also the protection may allow for routes to work into soft spots in the zone coverage and get open. Bottom line is it is frustrating to drop 7 vs. a 3 man route and still give up a completion. So what is plan B? Here is one solution. The NY Giants were defending a 3rd & 10 against the Ravens. The Ravens came out in a 2 back formation and used a 7 man protection. The outside receivers ran 15 yard out cuts. The #2 ran vertical into the middle of the field. 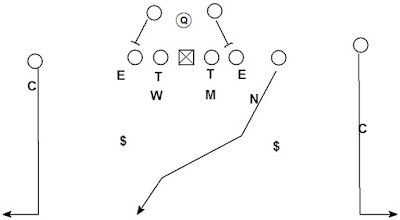 This route can attack 1 high safety coverages like cover 3 or cover 1 by isolating the corners vs. the deep outs. Similarly the out routes attack the corners vs. quarters and robber coverage. Against cover 2 the defense can play high low coverage vs. the outs with flat coverage corners and deep 1/2 safeties making the outs difficult to throw. 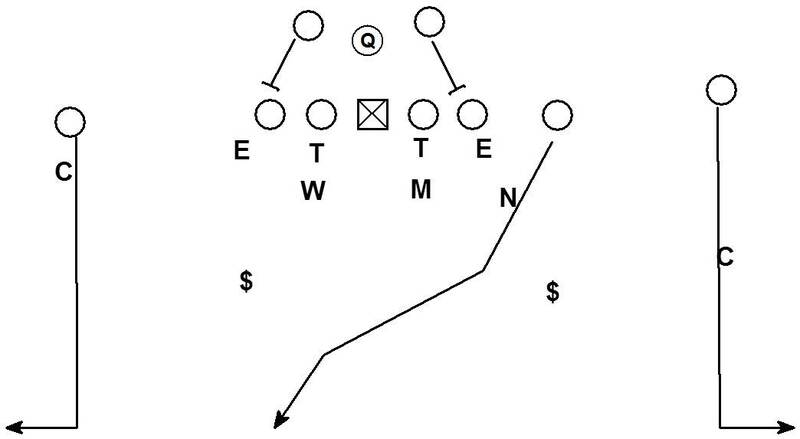 In that case, the middle of the field route by #2 is there to attack a cover 2 concept by splitting the safeties. This type of route could be difficult to cover even with 7 players in coverage. Giants defensive coordinator Steve Spagnuolo's solution, rush 8. The Giants are using 4-2-5 nickel personnel. Cover zero man with the pass rush covering any back that steps up to block them. You can see the left DE (#54) take the RB in coverage when the RB stepped up to block him. Some of you may be thinking, "Really, this article is saying the way to attack 7 man pass pro is to rush 8. Wow, thanks so much. I could have never thought of that on my own." Fair point, but I do think the conversation is deeper. 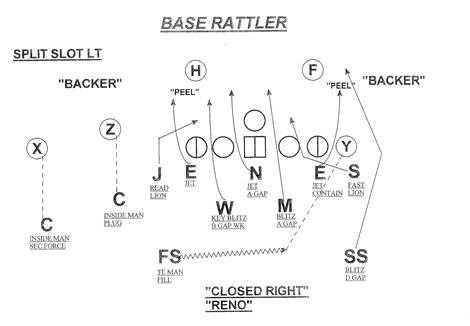 This is an 8 man pressure called Rattler from one of the Nick Saban playbooks floating around on the internet. I'm interested in the blitz and how it works. Even more, I'm interested in how, why, and when to use this blitz. Those are questions I'm trying to answer and the discussions I'm interested in having. As the season is coming to an end, we will begin the off-season process of self-scouting and planning for next season. Part of that process is a playbook inventory or what we will need or not need for next year. I think having an 8 man pressure concept or two is worthwhile. Do we need 5 or 10 of them? I'm highly doubtful of that, but 1 or 2 seems possible. Why? I think one of the offensive trends going forward is going to be more 7 man protection drop back pass. All the teams we face are spread. The bulk of the pass game is quick game, RPO, and WR screen. Teams are investing less and less in deeper drop back route concepts and protections. Even the 5 step concepts we see are all quick 5 step designed to get the ball out as soon as the QB plants on his 5th step. Six man pass protection schemes are complex and require a big investment. The pass blocking technique and blitz pickup take a big chunk of an offense's weekly practice time. If teams are going to continue to invest heavily in read run schemes and RPO's, something else is going to have to get less time.Teams will however still want to take deep shots and have a way to throw drop back. Having 7 man pass pro as a way to do that seems logical. The protection has simple rules, is sound, and could require less investment than 6 man drop back protection. Many of these spread teams are using 11 or 20 personnel with a H back type that can align anywhere and play the role of a 2nd back, WR, or TE. A 7 man protection can easily be run from these types of personnels and formations. We are already seeing some 7 man pro from these teams and I think we will see more. Having an 8 man pressure to attack these concepts is something to consider this off-season. Are we going to plan for an 8 man pressure vs. all 2 back looks and down and distances, no probably not. I do think having a plan B for 7 man pass protection is a good reason to have an 8 man pressure in our blitz package. Maybe it's a reason to consider having one in your's too. I appreciate this article. We too see a bunch of 7 in on pass pro. Will be communicating with you after the season and maybe we can compare some data. Definitely. I'm always looking for a better way. Great article...as Spread teams are making use of 20p twin open..& Diamond formations..you need Pressure options!